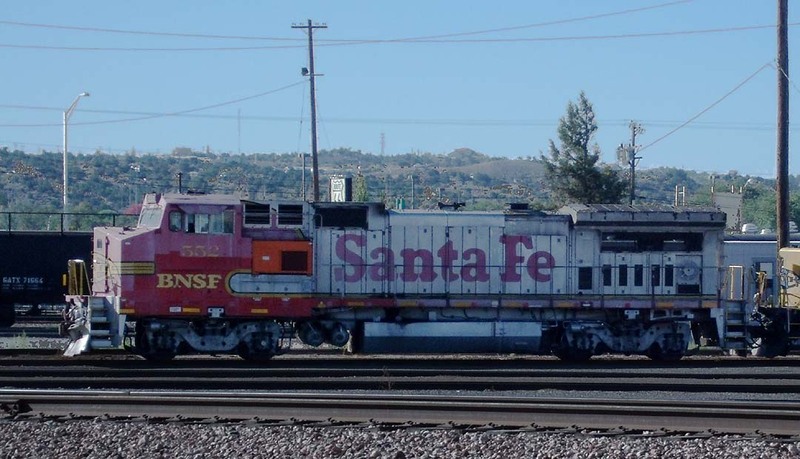 Note: Units renumbered by BNSF– even if still mostly in Santa Fe paint– can be found on the BNSF pages. SD40-2’s 5022 and 5027 are rolling an eastbound train towards the overpass at Mountainair on 5/07/1994. These were both delivered in November 1977. SD40-2 No. 5059, cresting Abo Summit on 5/07/1994. F45u No. 5953 is the trailing unit on a westbound autorack train, a few miles west of Abo Summit. 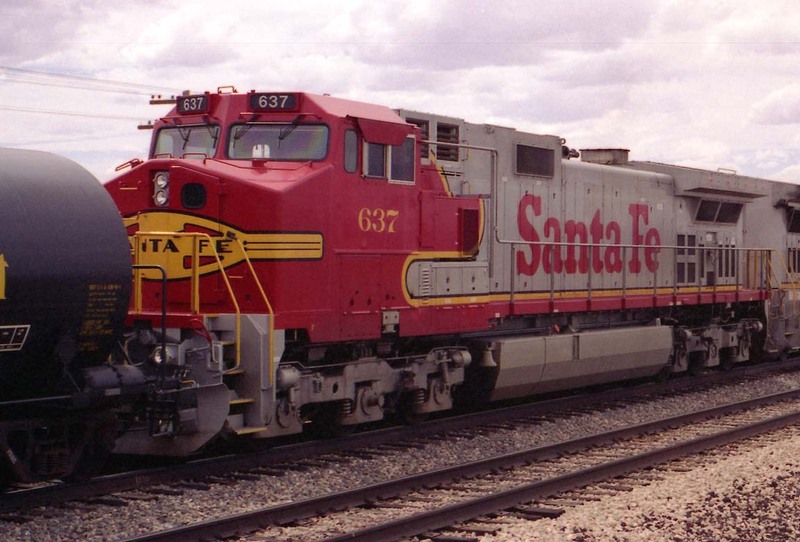 Originally built June 1968, it was painted in the SPSF scheme for a while, repainted back to bluebonnet sometime later. A matched set of SD45-2’s, Nos. 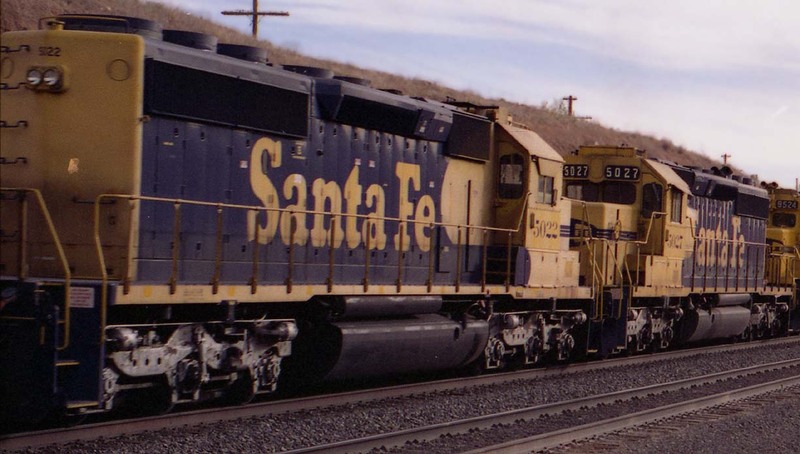 5827, 5864, and 5843, blast eastbound through Sais, NM on 10/11/1997. SD75M No. 242 cresting the summit at Abo on 10/11/1997. GP30u No. 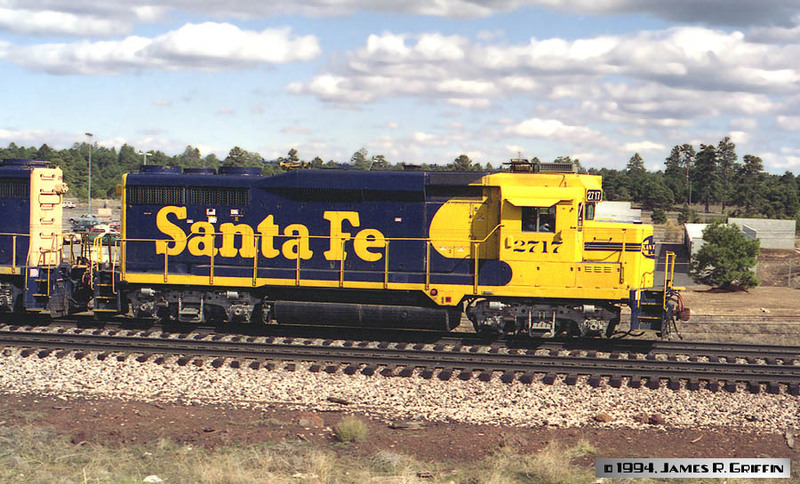 2717 in Flagstaff, April 1994. 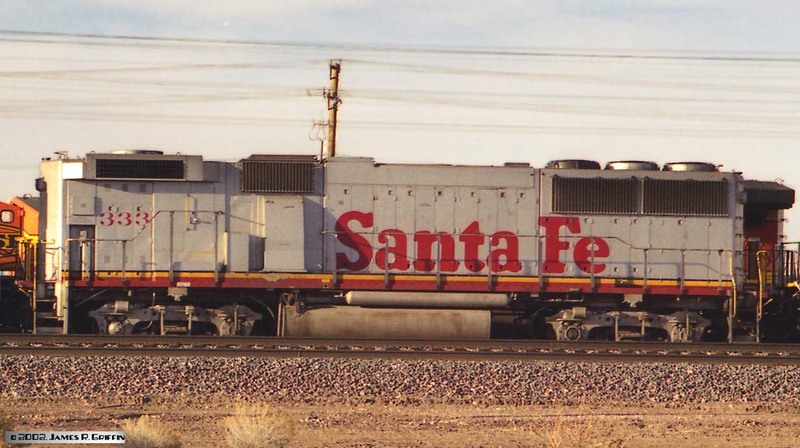 Santa Fe had a large number of these units. This one had spent some time in SPSF merger paint, before being put back in blue-and-yellow just a few years prior to this photo. 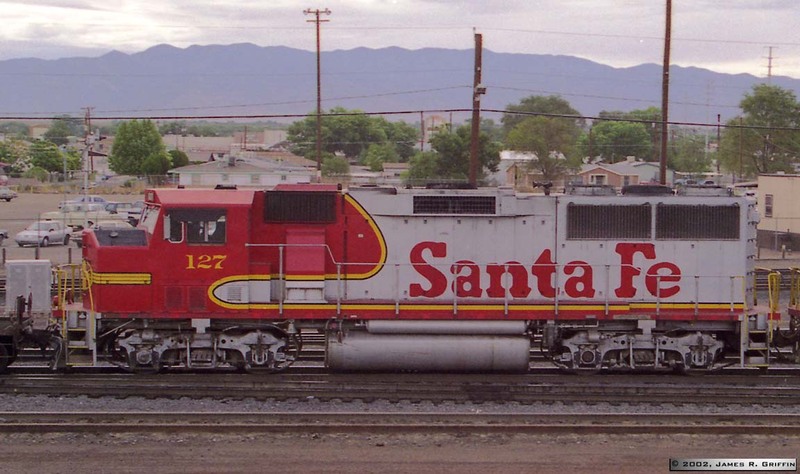 That probably explains why it’s much less faded than its GP35 companion to the left. GP50 No. 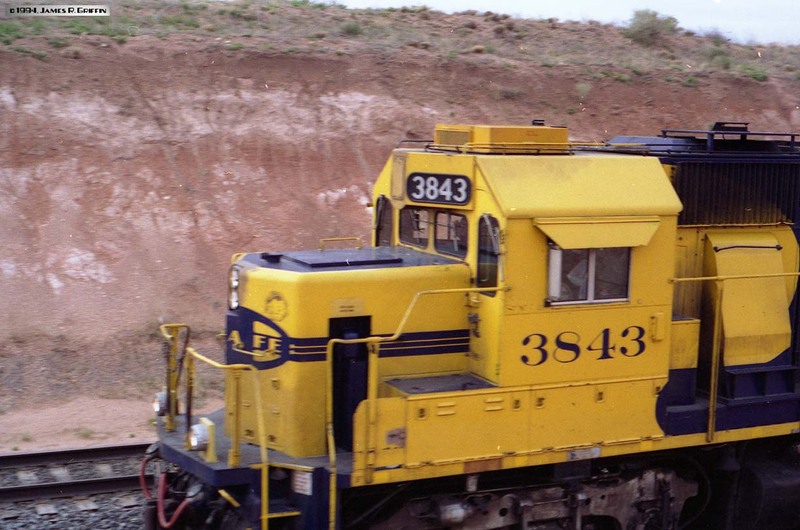 3843: close-up of the cab as it transits Mountainair on 5/07/1994. GP50 No. 3844, leading two other matching units westbound at the road crossing at Sais (5/06/1994). 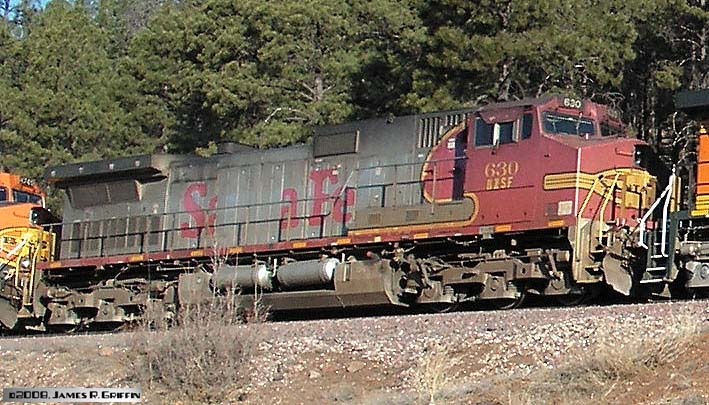 GP60 No. 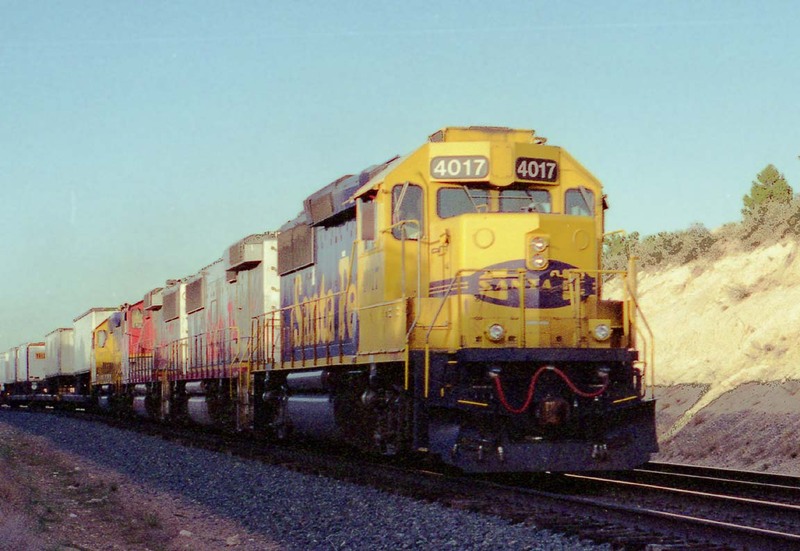 4017, a phase I standard-cab unit, leads three similar units over the top at Abo Summit on May 6, 1994. 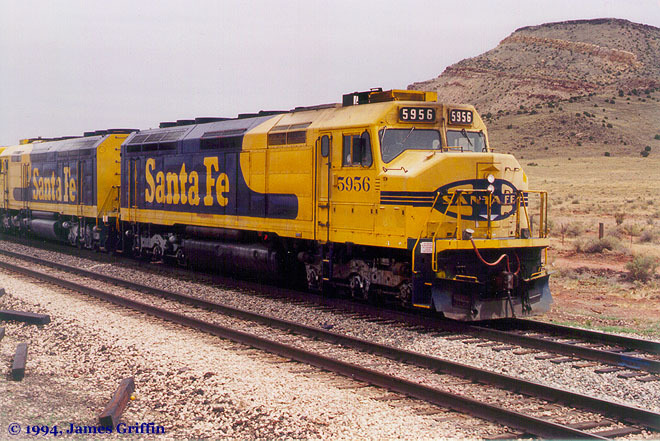 These blue/yellow geeps were Santa Fe’s last standard-cab 4-axle units. 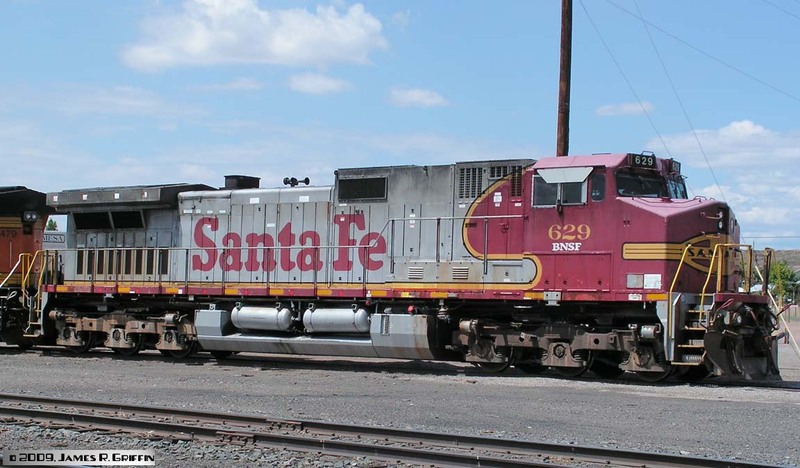 See here for several others, after BNSF renumbering. GP60M No. 104 is the third unit on this fast piggyback train (same as No. 4017 above). I recommend that you NOT walk in railroad cuts such as this; I did not hear the train coming until it was nearly upon me. Of course, in the modern age, the rent-a-cops would probably have you long before you got this close! The GP60B ahead of it might be No. 332; the number does not appear clearly in my photos. GP60M No. 119, hiding in the yard at Winslow on 10/15/2013. Sometimes, you just can’t get to a good vantage. Some of the silver is starting to weather, but at least the red on these units is holding up. GP60M No. 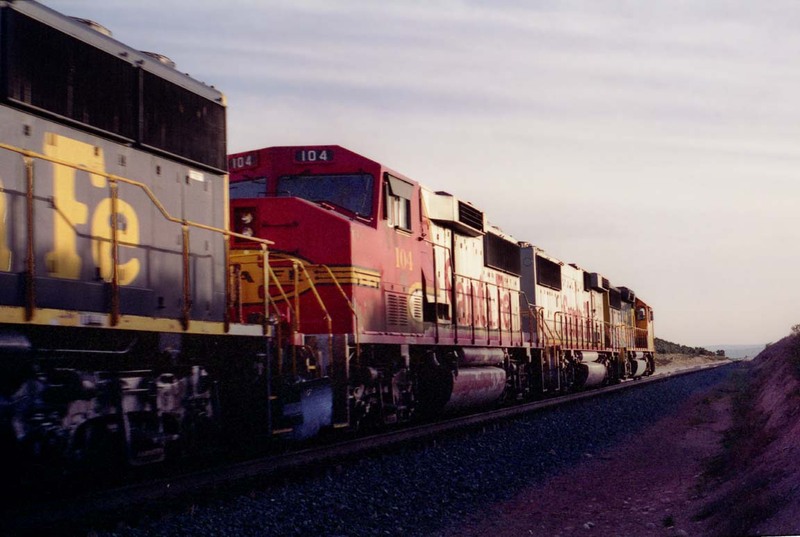 121, photographed in Barstow one evening in the early 1990s. It’s still glossy, and absolutely gorgeous. Photo courtesy of Clarence Dent. GP60M No. 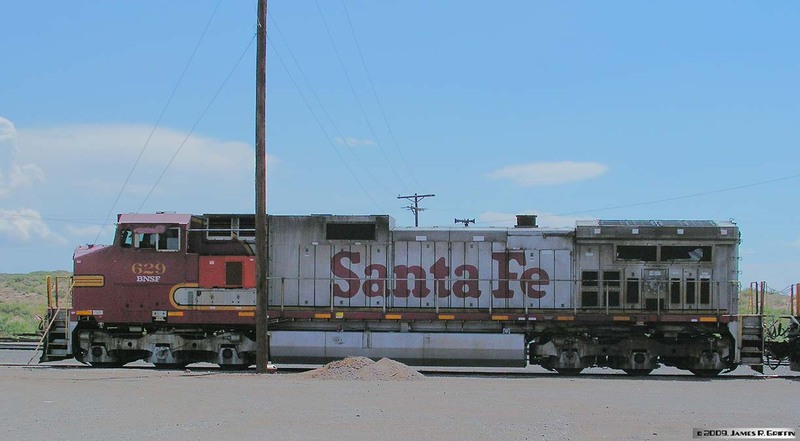 127, photographed in Belen on July 20, 2002. 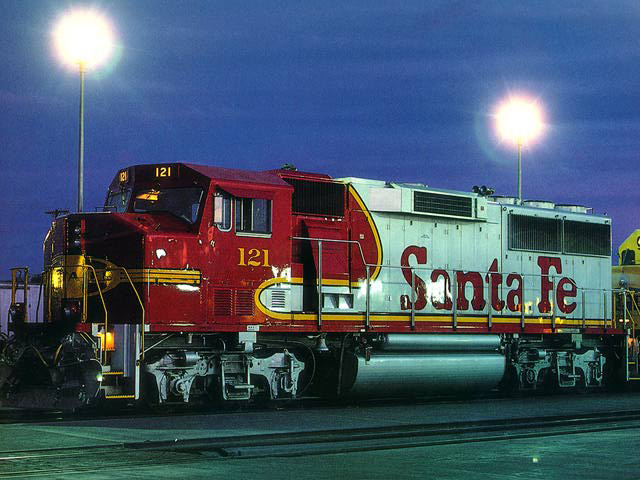 Delivered new to the ATSF in June 1990, it’s just had its twelfth birthday. No. 127 was not patched in any way at that time. GP60M No. 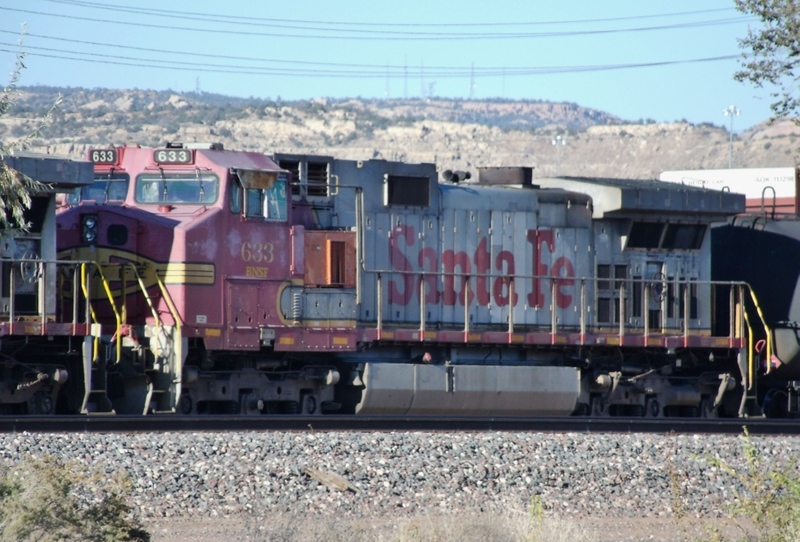 158 is on a westbound freight departing Gallup on 2/21/2011. It was one of three GP60’s of various versions on this train. Delivered September 1990, it’s looking great after over 20 years of service. GP60B No. 333 at Gallup on 1/26/2002. Not repainted or even patched at this point in time. 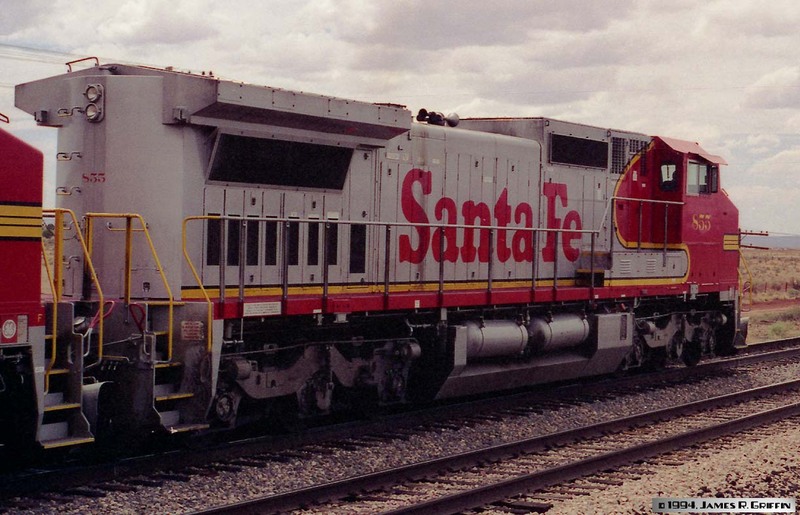 One of 23 cabless GP60s delivered to the ATSF in July and August of 1991. SF30C No. 9549 leads an eastbound J. B. Hunt train towards the crest of Abo Summit on 5/12/1995. 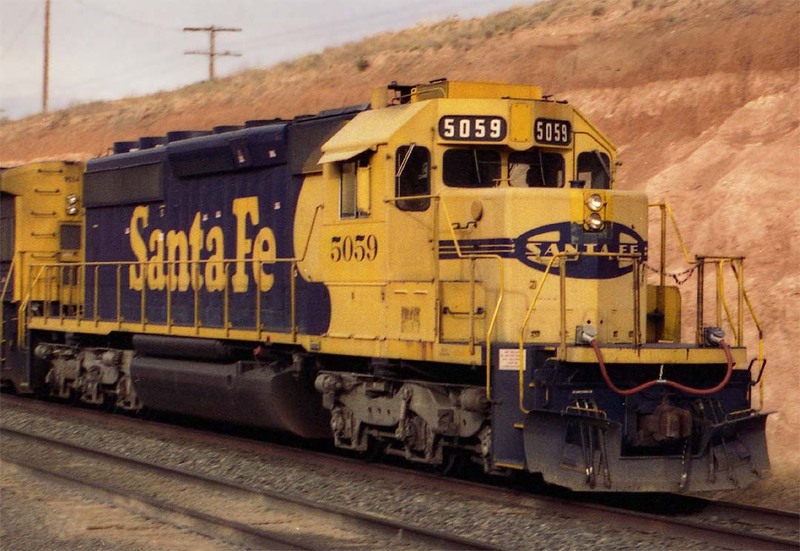 The SF30C’s were rebuilt by the ATSF’s Cleburne shops from U36C’s. This one had been No. 8777, delivered December 1974 and rebuilt in June 1986. B40-8W No. 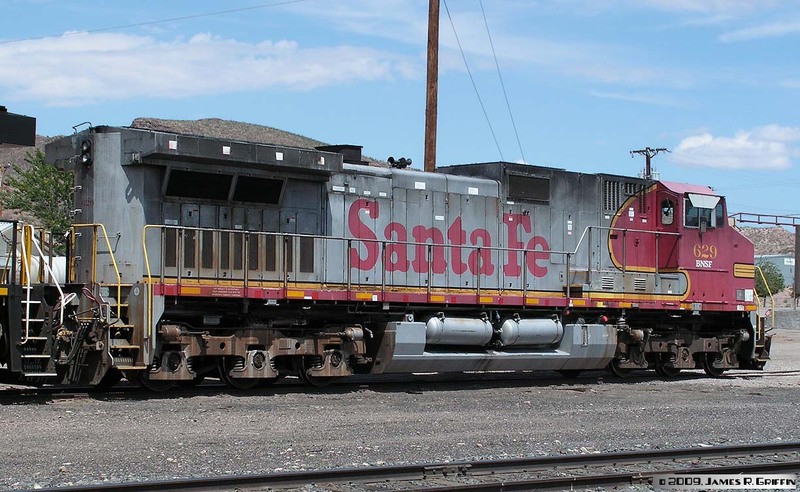 552, still mostly in Santa Fe paint. A pair of Dash 8-40C’s, with No. 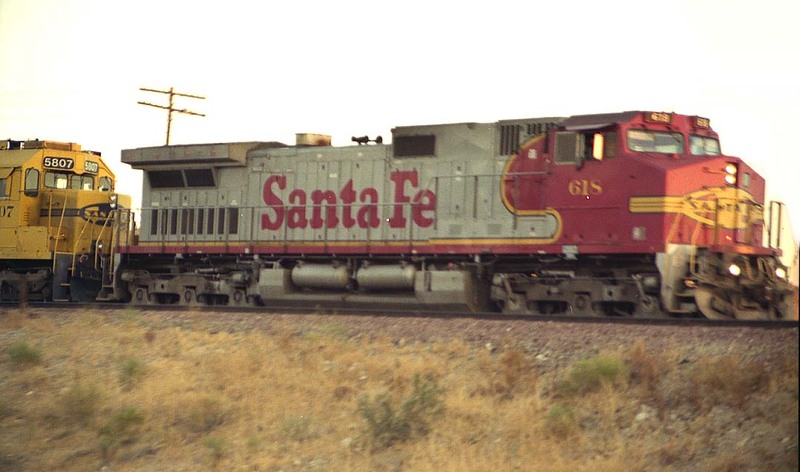 846 on the near end, cut in some cars in Colorado Springs on 9/15/1994. Dash 8-40CW No. 855, rear quarter view, on 5/07/1994. She’s about two years old in this photo, in her prime. Westbound near Suwanee, NM (about 5 miles south of I-40 on NM Hwy 6). C41-8W (or Dash 8-41C) No. 950 in Gallup on 10/15/2013. Very faded now, on its twentieth birthday– it was built in October 1993. Look at the truck sideframes and compare to the C44’s below and you will immediately notice the primary spotting feature of the Dash 8 series. C44-9W No. 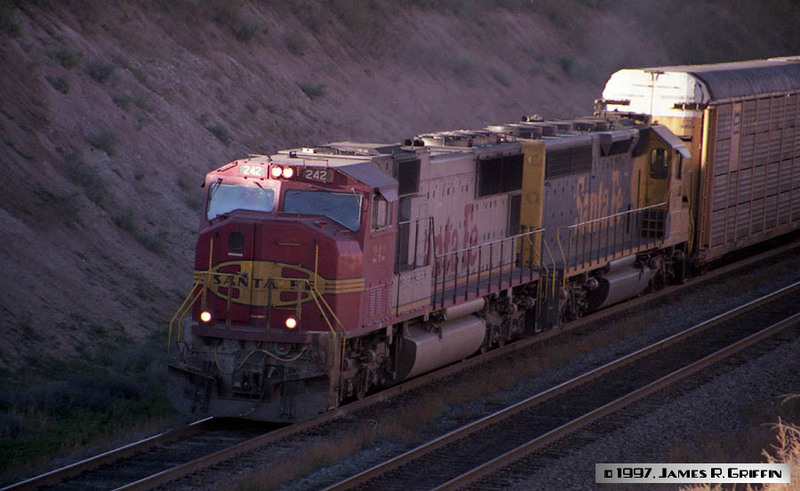 618, Leading west out of Needles at dusk on 5/23/1998. 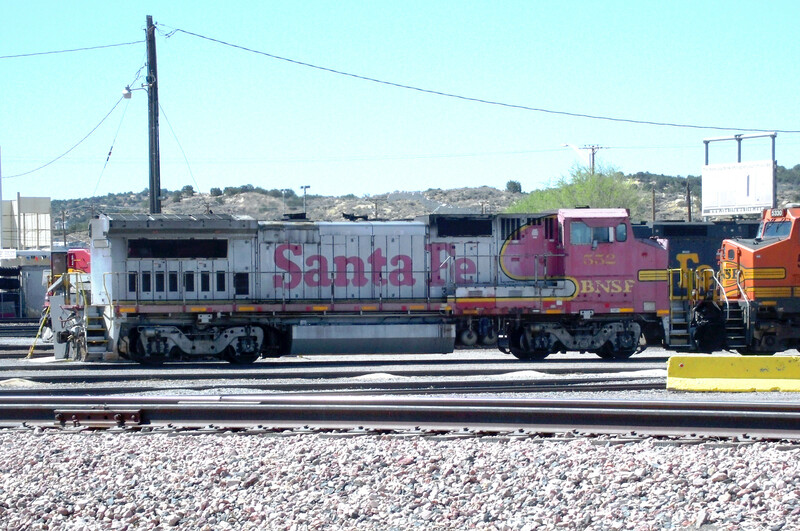 Still in full Santa Fe paint, no BNSF patch yet, nearly two years post-merger. Here are four views of the former AT&SF No. 629, resting at Rincon on 9/07/2009. Still in original paint fifteen years after delivery (Feb 1994), it has the usual BNSF modifications: yellow sill stripes (FRA mandated), and “BNSF” lettered under the cab number. 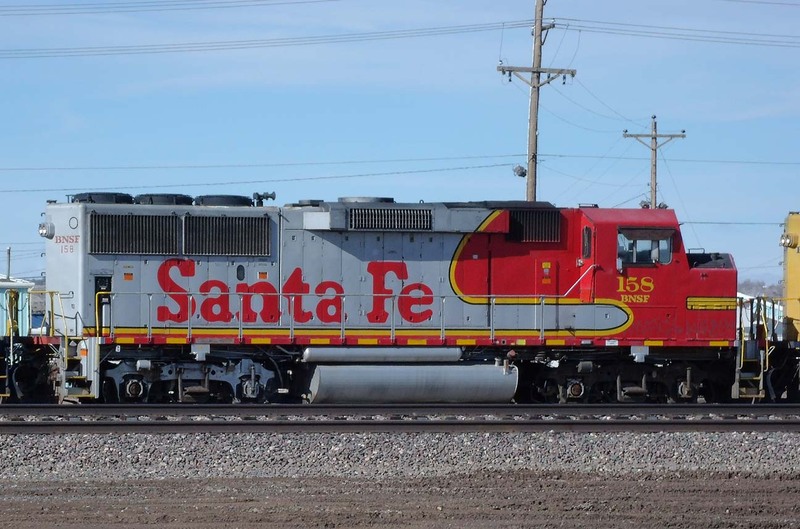 Note that the air conditioner has been swapped with one from an orange BNSF unit. These images are fairly large, to better show details. C44-9W No. 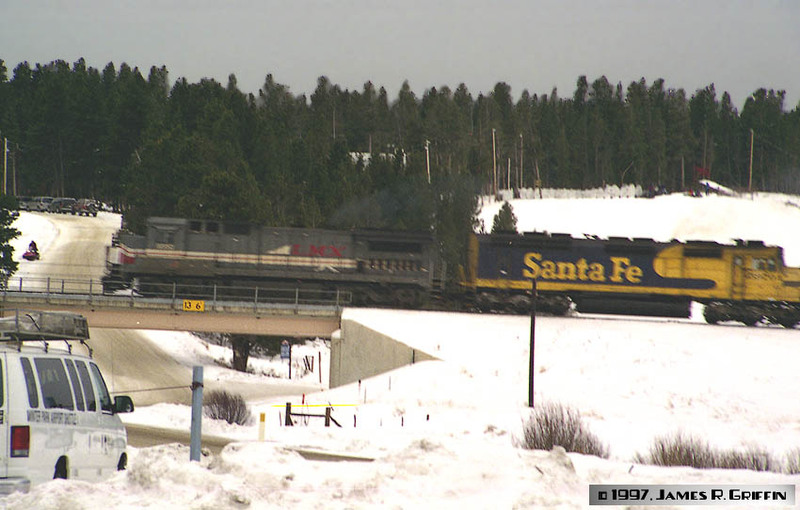 630, coming into Flagstaff from the west on 3/27/2008. 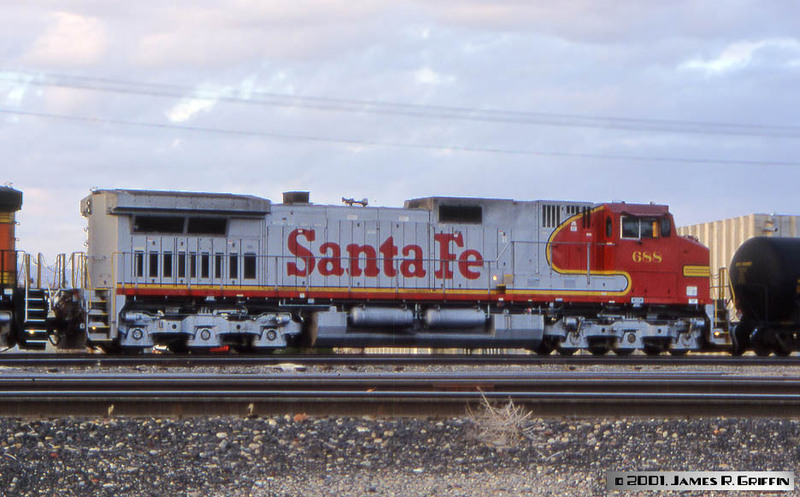 Still in original Santa Fe paint, but note the missing letters on the side. Contrast the “BNSF” reporting marks with those on No. 629 above. Built February 1994. C44-9W No. 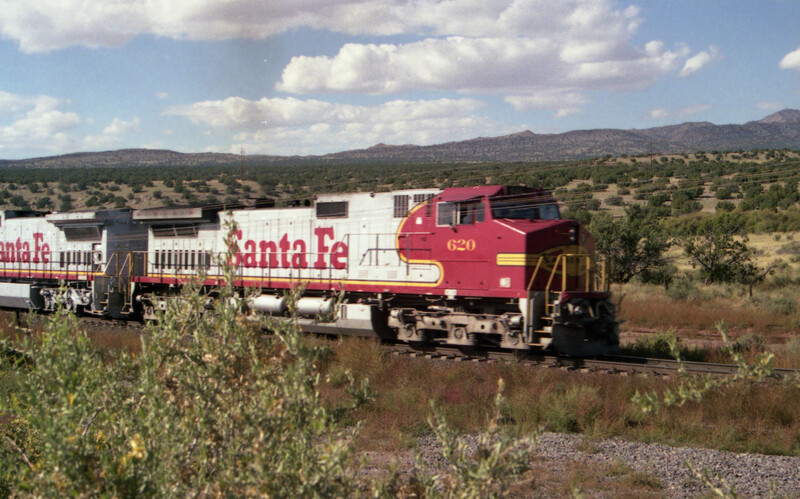 633 is on the point of a freight preparing to depart Gallup on 10/15/2013. The paint on this elegant old lady is in a sad state of oxidation by this point.Delivered February 1994. C44-9W No. 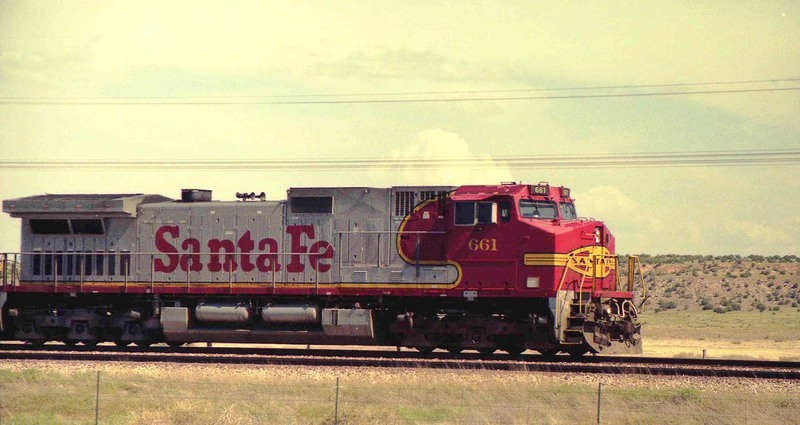 637, running third on a westbound freight near Suwanee, NM (5/07/1994). This is how they are supposed to look! C44-9W No. 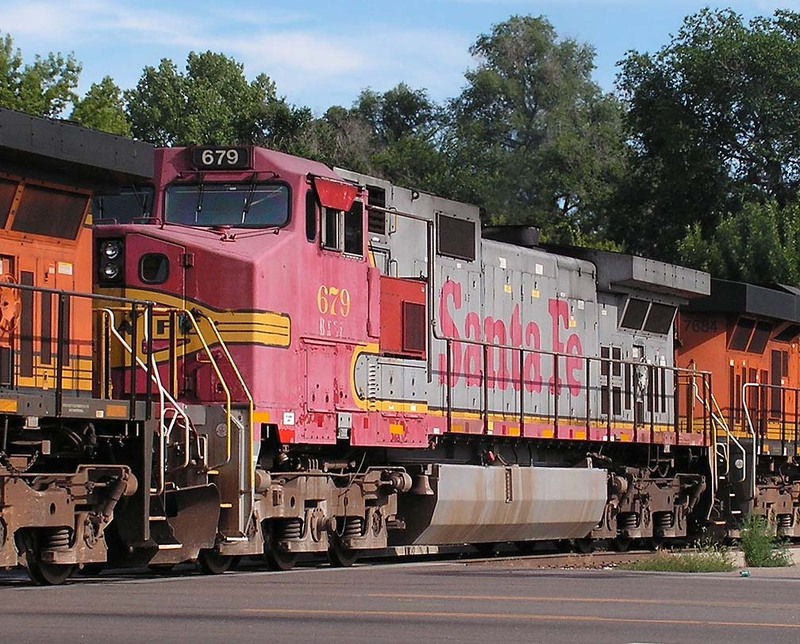 679 rolls southbound through Longmont, CO on 7/31/2010. This unit was built in August 1994, which makes it 16 years old at time of photo. 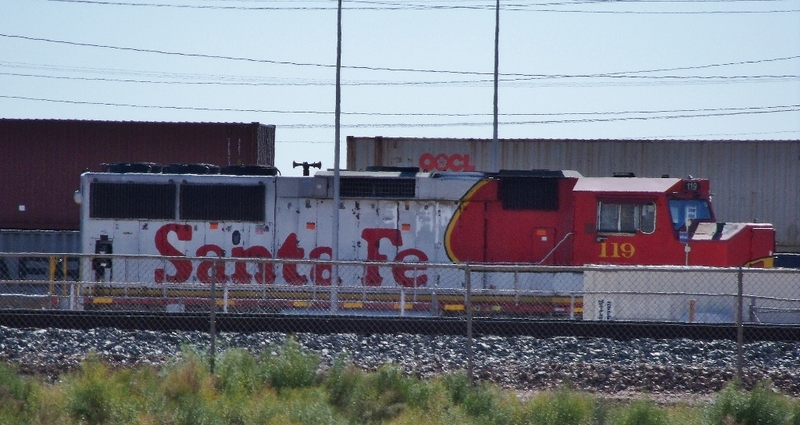 Still in original Santa Fe paint and number, it’s getting pretty faded, and carries a swapped air conditioner behind the cab. C44-9W No. 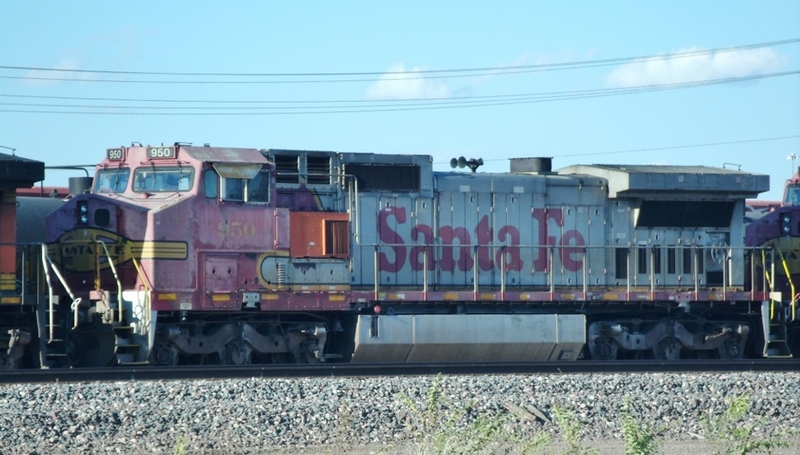 688, seen in Grand Junction, CO on 11/11/2001. 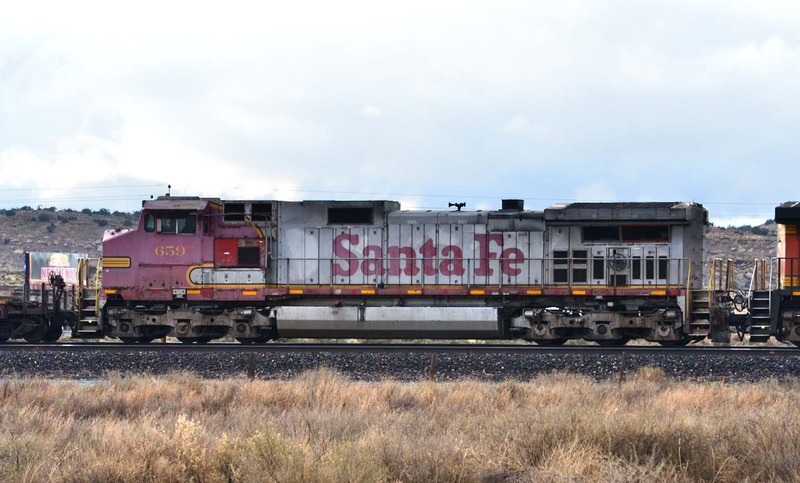 Nearly 7 years post-merger, it hasn’t been relettered or even sub-lettered with BNSF yet– fairly uncommon.